The Renard mine site in Quebec. 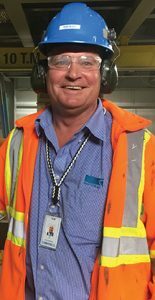 Whenever the ore sorting plant at Stornoway Diamond’s Renard mine in Quebec is down, loud complaints can be heard from the operator in the control room, says Stornoway’s vice-president processing, Ian Holl. “Even this morning, it stopped because we had an instrument air supply problem; the operator can feel the impact on the rest of the plant when he’s missing the ore sorting plant,” Holl said in an interview in December. The $22-million ore sorting plant was added to the Renard processing plant this year, and was in consistent operation by mid-year. It very quickly became a vital part of the operation. While ore sorting is not a new technology, Renard is the first diamond mine globally to incorporate it into its processing plant. The technology is more common in industrial mineral operations, but given the issue of lower-grade ore generally in mining and energy costs for crushing and grinding ore, it has potential for many types of mines. On a site visit to Renard in November, CMJ toured both the processing plant and the underground mine. Last year was a pivotal one for Stornoway because of the work it’s done on both sides. As it incorporated its ore sorting circuit into the processing plant, it was also transitioning to underground mining at the Renard 2 kimberlite. On the processing side, Stornoway turned to ore sorting technology because of high levels of dilution in the orebodies at Renard. The miner, which achieved commercial production at Renard in early 2017, found that the high levels of hard waste rock (mainly gneissic granite) contributed to a high level of diamond breakage in the plant. In an interview last year, then CEO Matt Manson and COO Patrick Godin said breakage was about 10% higher than expected (the industry norm is 10-14%). It made sense that removing some of that hard material from the processing stream would yield better results. Testing at the facilities of TOMRA, a leading manufacturer of sorting equipment, in Germany confirmed that, and the company decided to go ahead with the installation of a $22-million ore sorting plant. “The ore sorting project was approved at the August 2017 board meeting – and eight months later, it was operational. I believe that’s a major achievement – and in winter conditions as well,” Holl notes. Overall, the integration of the ore sorting plant into the main plant went smoothly. Nonetheless, the design included a bypass facility that allows the main processing plant to continue with production if the ore sorting plant is down. “We had our hiccups, not so much with the NIR sorting machines but more improvements from a material flow and spillage perspective – any start-up of a new circuit, there’s some work that will need to be done,” Holl says. Since late May or June the system has been quite stable and the company has seen a dramatic improvement in the operation of the process plant. “To date so far, we have seen a waste reduction of 15% plus of head feed, and we’ve seen a positive impact on the process rates at various downstream processes after crushing,” Holl says. There’s also been less diamond breakage, although it’s difficult to say how much of the reduction the ore sorting unit is responsible for, as the company has worked to minimize the issue holistically with multiple adjustments in the plant. One interesting benefit has been a saving on overall power consumption. Because a good portion of the hard waste rock is being removed before secondary crushing and other processes, the plant is now consuming less power than it was before the ore sorting plant was installed. That’s not to say the process was simple. Holl notes the technology is not “plug and play” but requires a lot of optimization, fine tuning/calibration and hands-on monitoring. He also warns that just because it has been a big success for Renard it doesn’t mean that it will be a big success for every operation. Every solution is adjusted and calibrated for each individual application and tailored to address project specific demands, he says. TOMRA, which was naturally keen to see this new application of its technology succeed, was involved with the ore sorting plant design and had representatives onsite for the first three months of operation, Holl says. The company also offers ongoing support. Stornoway uses TOMRA NIR (near infrared) sorters in its ore sorting circuit. (It also uses XRT sorting, another type of sensor-based sorting that separates material according to atomic density, in its large diamond recovery circuit.) The NIR sorter can differentiate between kimberlites and waste rock because of their different chemical composition. Those differences are visible through the application of NIR radiation, to which each element, molecule and crystal structure has a unique reflection/ absorption response. The sorter is also known as a high capacity free-fall sorter, where the material is fed to the machine via a vibrating feeder and waste is rejected with a precise blast of air. In Renard’s plant design, the material enters the ore sorting circuit after the primary jaw crusher and scrubbing circuit (which is necessary to make sure the material is very clean), and is sorted before it returns to the main plant at the cone crusher feed bin. The plant was set up to take material in the 20-200 mm size class. The sorting machines are limited to a specific size range to ensure optimum efficiency, however, so Stornoway has a primary rougher machine for feed from 60-200 mm and a secondary rougher machine that takes feed of 20-60 mm. The waste then goes through a scavenging machine that’s programmed to recognize and eject kimberlite instead of waste rock types. Holl says the big success in implementing the ore sorting technology with Stornoway’s process flow design is a low kimberlite loss of less than 1%. Stornoway will continue to fine-tune the ore sorting plant, and it’s also planning to add new personnel to help keep it running smoothly. “We will have a dedicated maintenance and operational person in this area – that’s how important it is,” Holl says. With the ore sorting established, Stornoway’s principal processing challenge is the full recovery of the diamond size frequency distribution that was projected in its 2013 updated feasibility study. Reduced breakage, better crushing conditions and careful management of the ore feed is expected to lead to improvements in this area. Underground production at Renard reached the full design capacity of 6,000 t/d at the end of August, about two months behind schedule. While development of the open pits at Renard – a combined pit at Renard 2 and Renard 3 and a separate, longer-life but lower-grade pit at Renard 65 – had gone smoothly, underground development was slower than expected. One issue was that the company had to change its underground mining method on the fly from blast-hole shrinkage stoping to assisted block caving. Outgoing Stornoway president and CEO Matt Manson told Diamonds in Canada magazine in October that all the preproduction data the company had indicated the orebody was competent but that when the mining crews started opening up production stopes, they were getting natural caves. The change in mining method to assisted block caving means a switch to horizontal panels from vertical, and will ultimately mean less blasting, less dilution and lower costs. In addition, the infrastructure and equipment required for both methods is the same. 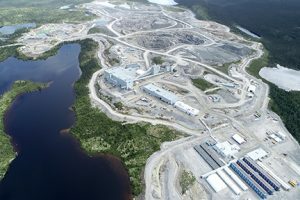 The issues underground left Stornoway short of ore to the mill, and a plan to extend the life of the shallow pit at Renard 2 and 3 to supply more ore last winter was stymied by bad conditions, said Manson, who was set to be succeeded as president and CEO by COO Patrick Godin in January. “That proved to be unfeasible during the winter because of bad winter conditions, ice, restricted access, and health and safety issues in the pit,” Manson said. The production shortfall, low initial grades in the underground, and some weakness in the diamond market prompted Stornoway to raise funds in October to shore up its balance sheet. The $129-million financing mostly consists of loan principal payment deferrals and adjustments to streaming agreements that will give the company flexibility it needs until it achieves a positive cash flow in 2019. “The objective now is to deliver the project’s cash flow potential,” Manson said, adding the big capital spending is now behind the junior. In its most recent reported sales at press time (for the third quarter of 2018), Renard diamonds achieved an average price of US$103 per carat. Now that underground mining is in full swing, Stornoway is looking at growing reserves and resources at Renard 3 and 4 and bringing some of that material into production sooner. As part of that plan, Stornoway is exploring the potential for another open pit at Renard 4 that would require a water retention structure within Lagopède Lake, but would allow the company to take advantage of the extra capacity in the processing plant that has been opened up by the ore sorting circuit. Processing of a 13,550-tonne bulk sample from the surface of Renard 4 is ongoing, with three “special” stones (10 carats or more) so far recovered. Development of a second open pit at the kimberlite would allow access to 2 million carats of diamonds in the top 140 metres of the pipe that are currently classified as indicated resources. Total probable reserves supporting a 14-year mine life at Renard (outlined in 2016) were 22.3 million carats contained in 33.4 million tonnes grading 67 carats per hundred tonnes.